NC Vote Tracker NC Vote Tracker is the user-friendly database at the Civitas Institute’s Carolina Transparency website that helps pundits, political junkies and ordinary people better understand turnout numbers for primary and general elections. The data comes straight from the State Board of Elections (SBOE) website, where it is refreshed each morning during the early voting period with the previous day’s early voting activity First introduced in 2010, NC Vote Tracker allows us to break down the early voting data by party, age, gender, race, congressional and state legislative districts. NC Vote Tracker: 2019 Election NC Vote Tracker helps people better understand early voting and Election Day turnout numbers. 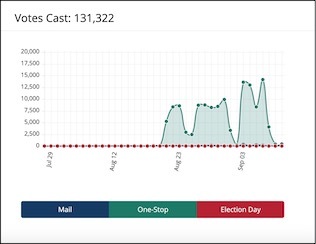 The data comes straight from the State Board of Elections (SBOE) website, where it is refreshed each morning during the early voting period with the previous day’s early voting activity. As soon as the data is ready from the SBOE, it is updated with Election Day data. First introduced in 2010, NC Vote Tracker allows us to break down the early voting data by party, age, gender, race, congressional and state House and Senate districts. Voter Registration Changes Does your county lean Republican or Democratic? 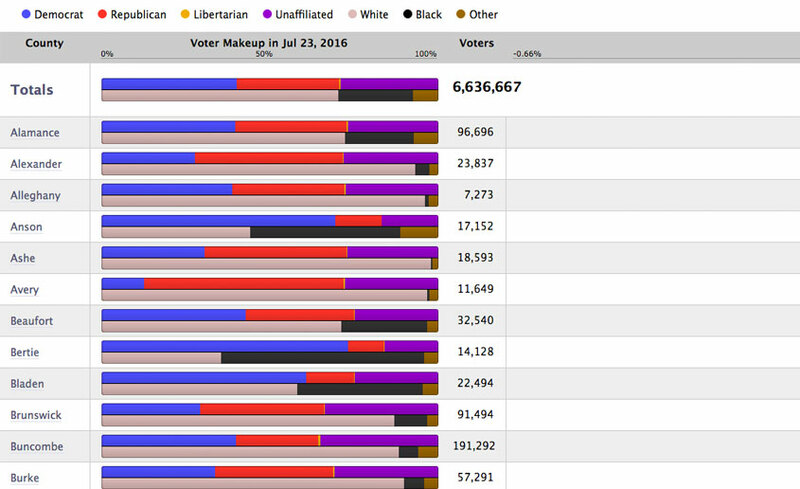 Find out the party and race makeup of each county, and the change in registration from month to month. A service of The Civitas Institute, a 501c(3) non-profit.